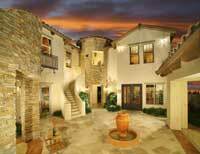 Tuscan Cliffs Homes in Southern Highlands Las Vegas real estate completed a 5,055 square foot luxury custom Las Vegas Home Plan Two customized home at its guard-gated Southern Highlands real estate, making immediate move-in possible for luxury living. This custom Southern Highlands home at $1.4 million, with decorative touches including dual custom wrought-iron doors, cherry stair railings with ornate wrought-iron and disappearing glass doors. 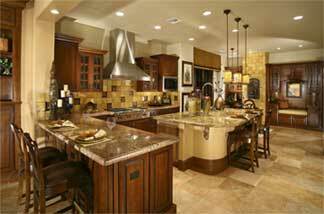 The kitchen is equipped with stainless steel appliances and an exterior summer kitchen. Electronic amenities included in this luxury Las Vegas home is an advanced structured wiring package for camera, intercom and an entertainment system. Tuscan Cliffs real estate in Southern Highlands Las Vegas designs feature a first-floor office area adjacent to a central courtyard, providing home owners with a private place to conduct business or work away from the distractions of the rest of the Tuscan Cliffs home. Pacific Southwest Development is the builder of the guard-gated neighborhood. The home floor plan is perfect for the professional who works at home, it is essential to have a functional and quiet retreat with a degree of privacy. Located in each of the Tuscan Cliffs homes there is an office adjacent to the courtyard that is separated from the more active areas of the home, such as the kitchen, media room, or family room.